PhiBrows: Amazing Natural Brows Treatment at El Oceano Beauty Salon. 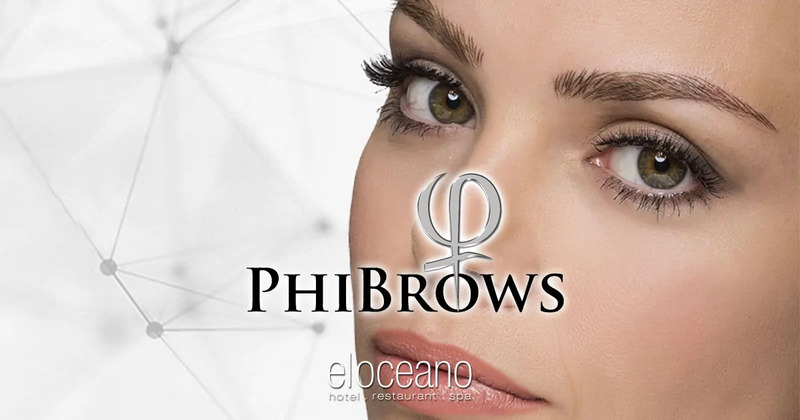 PhiBrows now available by Sarah Pierce at El Oceano Beauty Salon!! Phibrows is a manual skill of semi-permanent eyebrow drawing. Shape of the eyebrows are calculated according to the golden intersection (phi 1.618) and face morphology. PhiBrows – The Best Brows in the World! 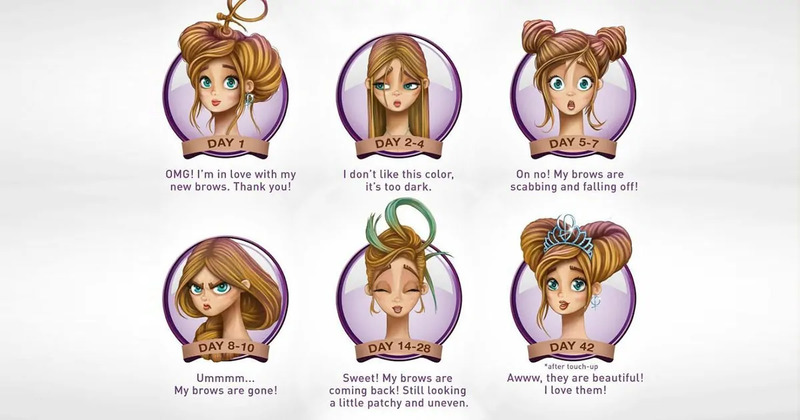 Home » Beauty Salon » PhiBrows – NEW! Phibrows is a manual skill of semi-permanent eyebrow drawing. Shape of the eyebrows are calculated according to the golden intersection (phi 1.618) and face morphology. Pigments are produced in accordance with the highest standards (PhiBrows microblading pigments). The pigment is applied with a sterile disposable Phibrows tool that has a row of several fine needles, to create thin hair like drawings in the skin. Pigment is applied into the surface layer of the dermis, making extremely fine natural looking hair strokes. A very natural result is achieved, as the hairs are drawn into the skin according to the natural hair growth direction. This creates a hyper-realistic look. Your first PhiBrows session should last around two hours, to give us time to explain and complete consultation forms. Your fabulous new eyebrows will go through several stages during the healing process. Please be patient until your six week touch-up, for the perfect healed results. The image below shows you what to expect over the first few weeks. This is all normal. Please don’t worry! Color duration primarily depends on how oily the skin is. The oilier the skin, the shorter the colour lasts. Sweating, gym and sun exposure also reduces colour retention. On average, expected time until a new colour boost is between 10 and 12 months. With oily skin it can be up to 6 months. The service can be a little uncomfortable for those who are more sensitive. However, there is an anesthetic applied after the first pass. This will numb the area and be virtually pain free. It’s not recommended to have the procedure when on your menstrual cycle, as you may experience more discomfort. This is a technique that involves a combination of microblading and brow shading. This creates more dense, fuller looking brows, that appear to be powdered, with microblading hair strokes. Microblading costs 260.00€, which includes your obligatory second/touch-up session. PhiShading costs an additional 50.00€, again including the two sessions. The skin must not be inflamed or in healing process before each treatment. Below is a list that can interfere with the treatment. Keloids or if you have tendency to Keloid, Birthmarks, Moles or Scars. Skin disorders or irritation on the area. If you have any questions about this treatment, or would like to make an appointment, please do not hesitate to call Sarah at the El Oceano Beauty Centre on 952 492 037, or email sarah@oceanohotel.com. Post-treatment makes 70% of the treatment’s success. Please obey advice, because if you don’t do so, you may lose up to 80% of drawn strokes. All of these factors are out of the artist’s control, so any possibility to provide guarantees for the treatment is excluded. Lymph is our body’s natural defence mechanism against the environment. Lymph turns into scabs/crusts. Scabs/crusts will be one of the causes for poor retention. NO Vaseline – Petroleum jelly can create the illusion of moisturized, hydrated skin, all the while suffocating your pores. It’s water-repellant and not water-soluble, it creates a barrier so that moisture does not leave the skin. YES Skin Candy – It’s made of natural ingredients and based on bees wax. This allows skin to breathe, heal faster and better. It won’t clog the pores and is a natural moisturiser without being too oily. Cleaning the treated area in the first day will help keep it clean against infections and also wash away the lymph. We DO NOT want scabs. Increased sweating, sports, swimming, hot sauna, hot bath or jacuzzi. Touching of the eyebrow area except for when cleaning and applying skin candy with a cotton swab. Before showering, apply a layer of post-care cream to protect your eyebrows from moisture. During the shower keep your face away from the shower head. Picking, peeling or scratching of the pigmented area in order to avoid scarring of the area or removal of the pigment. Antibiotic and Hormonal Therapy can lead to faster pigment fading. Always avoid Laser/IPL over the treated area. They can destroy the pigment and cause burns. Always apply a layer of sunscreen SPF 50 on your eyebrows when exposed to the sun. Sun exposure might cause the color pigment to fade away more quickly. (Don’t apply during the first 7 days). We recommend Phibrows Skin Candy Sun and Sweat Protection. Apply the cream 3 to 5 times a day, 7 days after the treatment. After 7 days, it can be applied only when necessary, 15 minutes before sun exposure or a workout. It provides double protection of pigments from degradation and fading. Very high protection from harmful effects of sun rays and preserves colour intensity. With every treatment, you will be provided with a complimentary aftercare kit. Aftercare Phi Wipes are used the first day of your treatment. No need to wash your brows with water or soap. Each box contains 5 wipes to be used on the 1st day. 1 Wipe after 30-45 mins and repeat every 1-2 hours with a new wipe. Your 5th wipe will be used before bed. Continuously dab dry the lymph with tissue. Apply Skin Candy only after last wash and PhiPatch before bed. Use cotton pad and provided sterile water morning and evening. Apply VERY thin layer of Skin Candy. Do not reapply during the day unless it starts looking and feeling dry. If area is still shiny, it doesn’t need more cream. Pat excess with clean tissue. Fitness Trainers – Use sterile water on cotton pad 3-4 times per day if sweating and apply thin layer of skin candy. 1 Wipe after 30-45 mins and repeat every 1-2 hours with a new wipe. Your 5th wipe will be used before bed. Continuously dab dry the lymph with tissue. Apply Skin Candy after every wipe and PhiPatch before bed. Use cotton pad with provided sterile water morning and evening with a thin layer of Skin Candy. If feeling itchy or dry, apply a thin layer of Skin Candy ONCE during the day. Pat excess with tissue. For all skin types – Every time you get them wet, dab dry and apply the skin candy. Don’t let them dry out, but don’t apply too much skin candy either. If the area looks moist and shiny, then it doesn’t need more. LESS IS MORE. Too much Skin Candy can result in poor pigment retention. PhiPatch is a sterile and waterproof adhesive PU dressing, with a high efficiency bacteria barrier. It is intended to be used on the first night when you go to bed, as a control of microenvironment of the wound. Open the paper pouch separating the upper flags until the wound dressing appears. Take the inner ends of the protectors and tear the released paper to fix at the right position. Fix the dressing firmly and tear off the PE back with the label, by pulling in the direction of the arrows. We recommend Phibrows Skin Candy Sun and Sweat Protection. Apply the cream 3 to 5 times a day, 7 days after the treatment. El Oceano Beach Hotel, Restaurant & Beauty Salon between Marbella and La Cala de Mijas: PhiBrows – NEW!